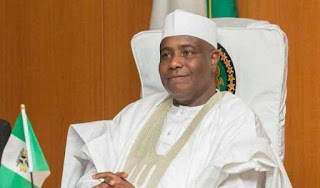 Governor Aminu Waziri Tambuwal of Sokoto state on Wednesday stated that he is under pressure to run for president in 2019. He stated this while addressing different associations of students and youths as well as resident communities who paid him a solidarity visit. He said "I have been receiving advices and encouragement from our leaders, peoples across the country and even from abroad to contest for presidency and this pressure is being mounting " . Tambuwal explained " It Is not my making but the quantum of pressure from every where because of leadership gap in the country." He said he would make his position public on the matter "in days to come". Responding, leader of the groups, Comrade Bashir Gorau pledged their support to the presidential ambition of the Governor. "We are tired of waiting, we want you to declare your position now," he said.